New York (TADIAS) — Ethiopia’s Ambassador to the U.K. is renewing his country’s call for the unconditional return of cultural and religious treasures that were looted by British troops at the Battle of Meqdelā in 1868. 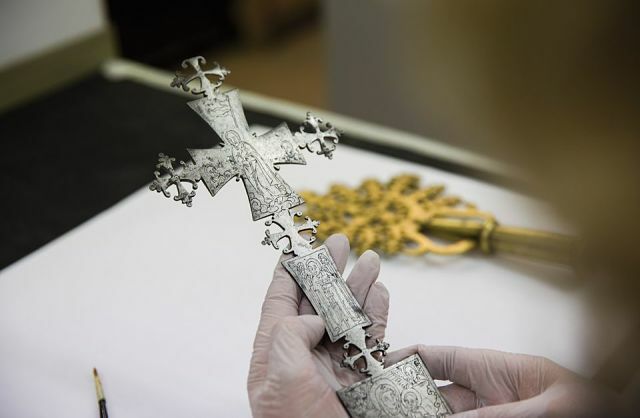 More than a decade ago Ethiopia had officially asked for restitution of the country’s looted treasures, that are being held at various locations in England. Unfortunately the request was rejected. According to Thomas Ofcansky and David Shinn’s book entitled Historical Dictionary of Ethiopia, the British army had employed approximately 15 elephants and 200 mules to transport the bounty seized from the treasury of Emperor Tewodros II and several Ethiopian Orthodox Christian churches. The gesture from V&A was made on the eve of the museum’s current exhibition that opened on April 5th showcasing its Meqdela collection on the 150th anniversary of the battle. According to The Art Newspaper, among the nearly two dozen objects featured at the V&A show include “a priestly gold crown, a gold chalice (both 1735-40), several processional crosses and imperial jewelry” that were forcefully removed from Ethiopia. Hailemichael, who attended the opening, indicated that he appreciated the public awareness value of the V&A exhibition. “When you have something that was hidden away and locked in the room displayed, that in itself is something that we appreciate,” said the Ethiopian diplomat. The Battle of Meqdelā took place in April 1868 between the British army led by General Robert Napier while Emperor Tewodros II led the Ethiopian warriors. The primary goal of the British invasion, which has been called “history’s most expensive hostage rescue operation,” was to free a group of European missionaries who were being held by Emperor Tewodros. The Ethiopian king had become upset after he failed to receive a reply to a letter that he had sent to Queen Victoria proposing to establish diplomatic and military alliance with his European counterpart. In the end, Emperor Tewodros took his own life and avoided being captured alive as the British closed in on him at his mountain fortress in Meḳdelā. The British rescue operation is estimated to have cost the British military some $9 million sterling, which converts to billion of dollars today. Given that the issue is bigger than one museum, would Ethiopia bring up the matter with U.K.’s Foreign Office? Ambassador Hailemichael also dismissed the long-held myth that Ethiopia does not have the capability to properly store the objects should they be permanently returned. He mentioned the national museum in Addis Ababa along with other modern museums such as the ones in Lalibela, Axum, Gondar, and Harar as well as universities with active programs on cultural heritage management. “The whole of Ethiopia is a museum of its cultural heritage,” Hailemichael said at one point during the interview. Photos: Although Tewodros turned the gun on himself in order to avoid being captured alive, the British soldiers took his young son, Prince Alemayehu Tewodros (who died as a teenager while in exile in Britain). UK Museum Wants to Loan Ethiopia Looted Ethiopian Treasures. Why Not Return It?